This beautiful apartment is in a 16th century former Monastery of Santo Domingo built right over the Palace of Cuauhtemoc, right in the core of the Centro Historico. It's a peaceful enclave (where you can't hear any traffic) just 50 yards from Plaza Santa Domingo and less than five minutes walk from the Zocalo - the main central square. 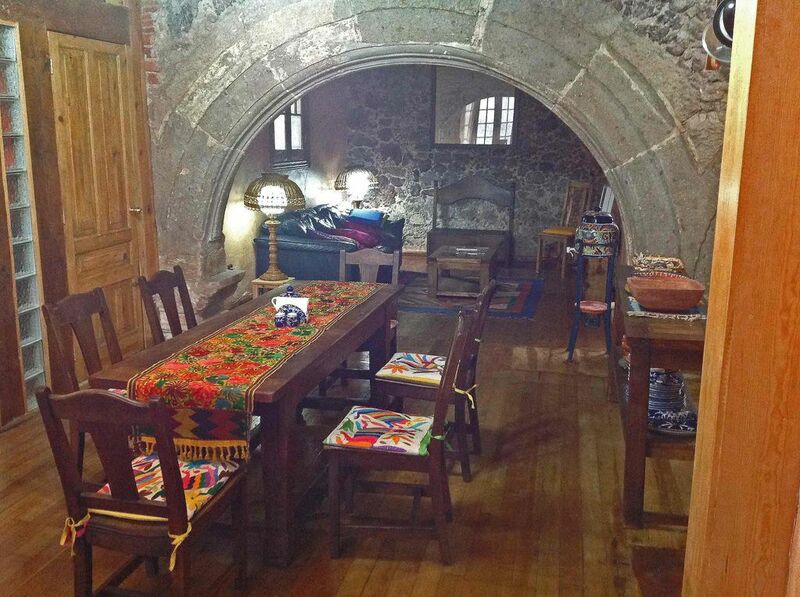 This apartment contains a magnificent stone arch originally constructed by the monastery in the sixteen hundreds. The apartment has been beautifully restored with original stripped wood floors and colour washed plaster walls and is on the first floor of the building which is arranged around a courtyard. Most of the residents of the 30 apartments are Mexican families so you will get a real flavour of life in Mexico City. The first floor is reached by a flight of wide stairs. The bedrooms look onto the main central courtyard. Kitchen/dining room - fridge/freezer, small cooker, sink tiled with hand-made tiles and coffee maker. Hand-made table and chairs to seat six. Sitting room/lounge - sofa, hand made desk, chairs, small television & DVD player and Wifi. Bedroom 1 - Double bed. Bathroom - Wet room with shower, toilet & marble wash-basin. Beautiful area which is being refurbished. Three blocks from the Zocalo, many beautiful buildings round about, an outlook towards Santo Domingo Church. Easy walking distance to many historic sites such as Templo Mayor, The Cathedral, San Ildefonso Museum, Museo Nacional de Arte, Palacio de Bellas Artes. Three metro stations within easy walking: Zocalo, Allende y Lagunilla. Taxis easily available very reasonably priced. Sunday cycling with free bike rentals on cleared streets in the Historical Centre. Plaza Santo Doming Cafe and good Mexican food at Hosteria Santo Domingo. The location is popular with film makers, most notably Denzil Washington in Man of Fire, Dennis Quaid and Forest Whitaker in Vantage Point. TV also like to use it for soaps and adds. Frequently other entertainers use the Plaza, for example music and dancers, and equestrian events from time to time. Featuring stunning architectural details and rustic Mexican décor, this charming, well-equipped, 2-bedroom apartment is up one flight of stairs overlooking the inner courtyard—the filtered light through the windows gives the space an atmospheric and evocative air. The kitchen included coffee, bottled water, and basic condiments. Both bedrooms were quiet, with firm beds and comfy linens, and we liked the cozy seating area with two sofas. (We had no problem with hot water in the shower.) The location off beautiful Plaza Santo Domingo is very convenient for sightseeing, one of the nicest corners of the Centro Historico, and Arturo is a wonderful, kind gentleman who sincerely cares about his guests. During our stay we were able to visit the museum he oversees in the same building, where we viewed a selection of paintings by his late wife, Sarah Tisdell, which we felt very fortunate to see. Overall, this unique apartment may not be for visitors who require every predictable 21st-century amenity, but we loved staying in this historic structure in the heart of downtown Mexico City, and would return. Wonderful location, apartment and host. Artero was an extremely interesting and creative man. It was an honour to have him as a host. Oh and Mexico is quite amazing as well. Host very accommodating and helpful. Great Location. Comfortable and clean. Two problems: no hot water and shower was not contained and leaked water out of the shower area and into the living area such that we could not use the shower during our three night stay. Historic building, quiet, amidst families, perfect location for tourists, spacious and well kept. Great host. A cosy apartment in a renovated convent with loads of character. The neighborhood has many colonial era buildings and is buzzing with street life. It is the perfect place from which to explore the Centro Historico--the Zocalo is a five minute walk. Arturo, the landlord, could not have been friendlier. We would stay here again if the opportunity arises. The flat was very charming and Arturo was an extremely responsive and very nice host! 1 guest or a couple 90 usd per night, 590 us per week, 2000 us per month 2 guests, one bedroom each, 110 usd per night; per week 700 us; per month 2500 us; 3 or 4 guests, two couples two bedrooms, 130 us per night, 800 us per week, 2800 per month; 1 or 2 people long term per month 2500 us.